Toptal is proud to host our first VR Workshop in Malaga, taking place on February 8 at 7:00PM to 9:00PM. This meetup welcomes anyone with an interest in VR, and there will be a team building component. 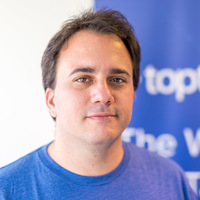 This will also be an opportunity to meet Ramiro Palacios, a Toptal Sourcer and Community Leader for Málaga. Come get to know the local community, and feel free to invite a guest if they would be interested in finding out more about Toptal.